I was surprised to find that I had never seen Race With the Devil. This 1975 film was chosen as a favourite by the author Sean Hutson in a recent edition of SFX magazine. 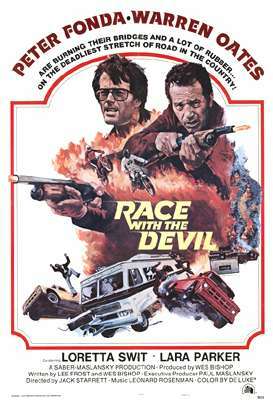 It stars Peter Fonda and the great Warren Oates and blends a mix of road movie with a dash of Satanism. This isn’t as an accomplished movie as, say, Rosemary’s Baby but is much less mannered and far more enjoyable than Spielberg’s Duel and better than, coming much later down the line, The Hitcher and Tarantino’s Death Proof. The premise of Race With the Devil is that of a camping holiday gone very wrong. Lacking here is campside singsongs, barbecues and cool beers, replaced instead by deadly car chases, eerie petrol stations, inefficient cops and – oh yes – snakes. Snakes that make, if this is possible, Snakes on a Plane look very ridiculous indeed. There’s lots of shots of screaming women in this film. And very often of screaming men. Fonda and Oates play two regular guys out caravanning with their wives, Lara Parker and Loretta Swit (from MASH), who run into big trouble. Possibly the one drawback of the film is that it never settles down into a particular genre. In the early scenes we see a lot of Fonda racing around on a motorbike, stopping now and then to remove his helmet and look pretty. Perhaps a throwback to his Easy Rider days, but unnecessary. Also very early in the film Fonda and Oates happen to eavesdrop on a scene of ritual sacrifice. What begins as what could be a sequence from Carry on Camping (‘ere Sid, have a butcher’s through these binoculars and cop this!”) quickly turns into our main quartet of characters running for their lives. Like Duel, this is a film where the nameless and mostly unseen enemy pursues and pursues, relentlessly and terrifyingly. But, despite how it may have been billed over the years, it remains essentially a chase film, with only a glimpse or two of anything supernatural. Interestingly, Race With the Devil still works brilliantly despite the fact that its central theme is now over familiar. This is possibly because the best themes will continue to be used; much of this film reminded me of the recent (although obviously much less restrained) Wolf Creek. People get chased by bogeymen. This is film lore, we learn it but it still entertains. We know that Fonda and Oates will fail in convincing the police that they are being followed by Satanists. We know that every single petrol station they visit will have a telephone that doesn’t work and a particularly creepy attendant. We know that it is absurb how they are persecuted so easily (but this is nevertheless still convincing). We suspect (and hope) that this film will end rather bleakly. So essentially Race With the Devil is manipulative of its audience, setting up a ridiculous yet highly enjoyable premise. I suspect this movie works so well because it is so rooted in the 70s. In the pre-cellphone age a scene shows Parker and Swit visiting a library to research devil worshipping (they end up stealing two reference books). Isolation was so easier to portray 35 years ago. The sheer size and emptiness of America adds to their hopeless plight, an inhospitable and alien landscape where you don’t really have to travel as far as the hillbillies of Deliverence to find trouble. If I had to find one word to describe Race With the Devil I would describe it as a hoot. By this I mean a film that’s simply very enjoyable but one that won’t stand up to too much scrutiny like, again, Rosemary’s Baby. The scene with the two rattlesnakes inside the caravan is superb. Oates, as always, is a very watchable actor. The director, Jack Starrett, also does a good job in adding to the drive-in exploitation canon that he excelled in. The movie is fast and energetic. What raises it high in the horror genre is its ending; sudden, nasty, shocking and brilliant.